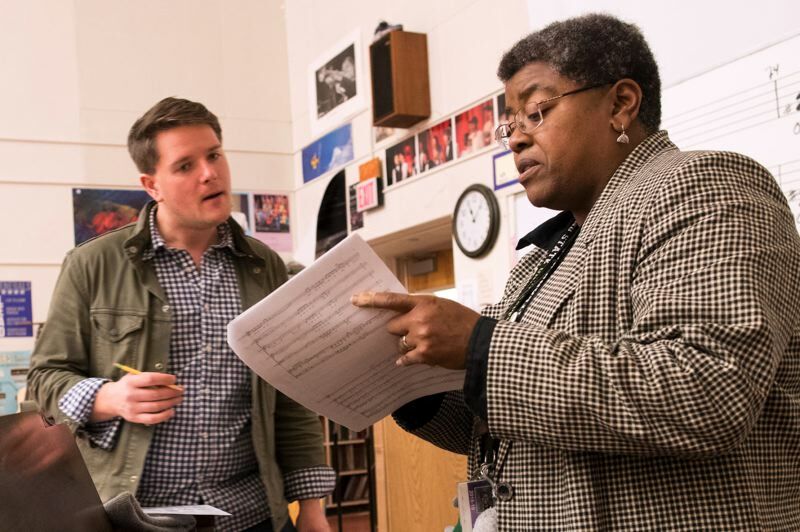 Out of a 2015 school district decision grew an unexpected friendship when two music teachers came together for their students. But if you can summon the inner strength to change your approach and look for new opportunities, you can find a jubilant day. At least that's the story in a new song from composer and Lane Middle School music teacher Judy Rose. 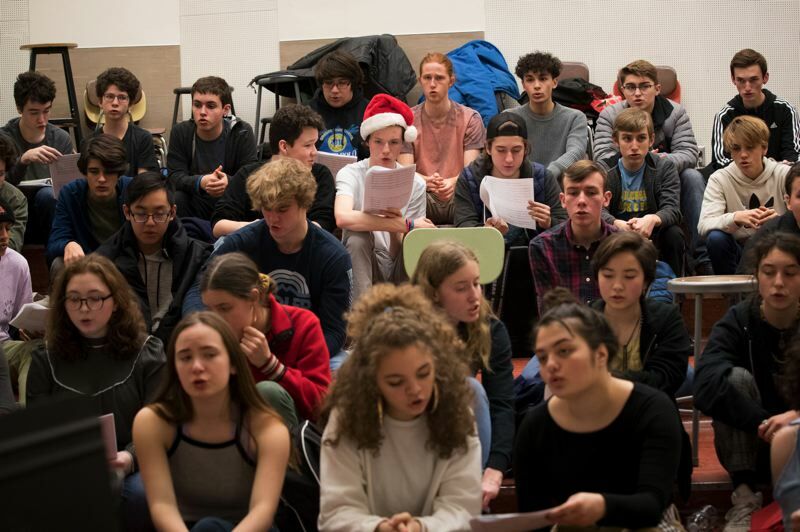 It also is the story of how a 2015 school district decision upended many students' Christmastime choral traditions — but also led to new musical partnerships across Portland schools. The song, "A Jubilant Day," came out of Rose's desire to create a work of art to bring joy to a dark world. "I believe that getting through what we are all experiencing in the world right now, that there has to be some joy in the world," she wrote in an introduction to the song. "If there is to be that joy, we must create it. By creating music, poetry, dance, works of art, we are creating that joy for others to hear." In August, she gifted the work to the Grant High School choir and its choir director, John Eisemann. 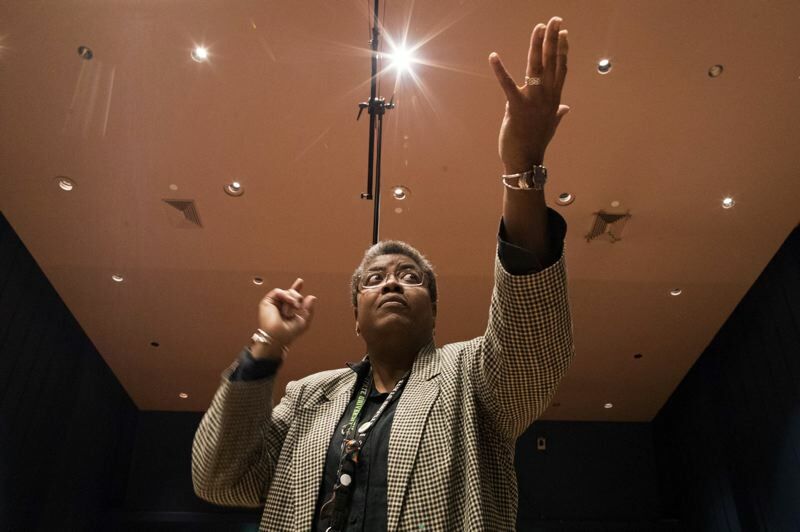 Eisemann, who also is interim director of the Portland Symphonic Choir, said Rose has "amazing abilities as a composer and creator of collaborative joy." The song, a spiritual, is deeply resonant in tone and also in lyrics. Avery Prevatt, a Grant High School senior and member of the choir, said she connects to it. "It's just beautiful; I love it." Prevatt said. "It kind of lets you be a part of the song." "It's a lot of fun to have heard it come to life, to hear the kids kind of personalize it," Rose said. The school choir recorded the song Dec. 12 and released it as a free download on BandCamp.com. The world premiere of "A Jubilant Day" was Oct. 17, during Grant's fall concert. 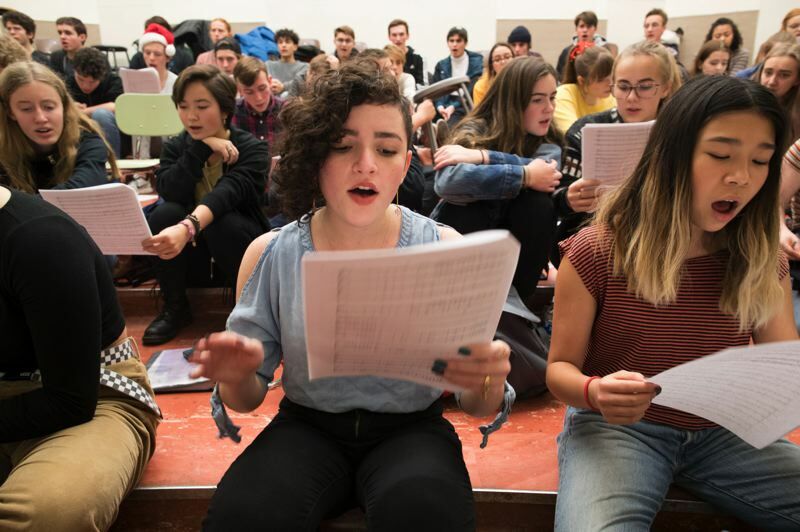 Another public performance of the work by the nearly 80-member choir is expected during the April Portland Interscholastic League competition, and, if Grant scores high enough at the local contest, at the state competition. Rose and Eisemann's friendship and collaboration started three years ago, when the school district ended a long practice of allowing school choirs to sing at The Grotto's Festival of Lights. The Northeast Portland Catholic shrine's chapel is widely appreciated for its acoustics. But a national atheist organization and the American Civil Liberties Union pointed out that the Catholic Church was making money off of students' performances there during the festival, and they threatened legal action over what they saw as a violation of the constitutional requirement for separation between church and state. A November 2015 school board proposal to reverse the district's decision to bar choirs from the festival narrowly failed, 4-3. By that time, Eisemann already had organized a concert at a new venue and invited Rose to bring her choir. She readily accepted. "It just sparked this cool friendship," Rose said. Lane students also now participate with several school choirs in the annual "Let Us Sing!" concert developed in reaction to the district's decision. The annual event is held at The Old Church, a nonprofit downtown venue in a former church. In fact, school choirs continue to sing in many religious spaces because they often are built for music. Eisemann believes communal singing is one of the oldest and most universal traditions among human beings — a tradition that modern American culture seems to have lost. He identifies himself as nonreligious, but Eisemann said he wants his students to be exposed to that aspect of life. "Portland has an issue with religion. ... We're so afraid of it," he said, adding that he thinks that is a disservice to students. Many Portland-area public schools continue to send their students to The Grotto's Festival of Lights. There have been no reports of lawsuits over the practice. Rose also thinks singing in religious spaces — be they a church, a synagogue, a mosque or other spaces — allows students to experience the world around them. Now that there are many new school board members, Rose and Eisemann both hope that the issue of singing during the Festival of Lights can be revisited. "I would like to explore that option. It's good for our kids to have diverse experiences," Rose said. "Singing at a place like that, I think it only heightens their awareness that the community around them is bigger than they realize." "A Jubilant Day" is in the style of a spiritual, and Rose acknowledges that some Christians may think of their faith while singing it, just as others may bring their own meanings to the words. But, as the composer, she explains that spirituals have roots as subversive protest songs sung by slaves in the South. To her, the song is about overcoming the troubles she faces as a black woman in 2018 America. "It's, to me, about living each day the way you want to be in the world," Rose said. Grant High School senior Ethan Blatter said his favorite part about the song is that it is emblematic of choral singing in general: Each person brings their own emotion and meaning to the words, but everyone is united in song. "The fact (is) that we're all singing together, but we're all singing for different reasons," Blatter said. He also likes how he feels singing it. "It just kind of screams self-confidence," Blatter said. "Like: 'You're perfect the way you are.' That's kind of cliché, but the way it's presented is really genuine. It's awesome."